Most people wrestled their entire lives with the question of whether we have free will and consequently control over our lives; or perhaps, life has pre-ordained path already chosen for each of us. This very question was posed in one of my all-time favorite movies— Forrest Gump. The 1994 Academy Award winning movie begins with a nondescript white feather that drifts through the opening sequence and lands at Forrest Gumps’ feet. He is waiting for a city bus and talking with others waiting nearby. Without any explanation or dialogue, he picks up the feather and carefully places it in a Curious George book that he puts into his briefcase. The feather is never mentioned nor plays any part in the entire two and a half hour movie until the very end. 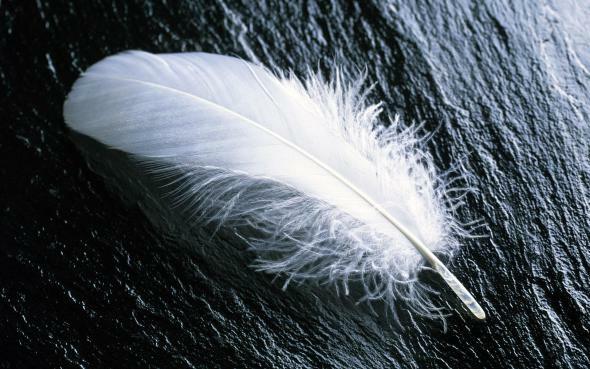 At the end of the movie, many years have passed since the day Forrest Gump first encounter the drifting feather. While waiting for the school bus with his young son, Forrest reopens the same Curious George book that had stored the compressed feather all those many years. Exposed now to wind, the feather takes flight, catching a breeze and gently wafts up into the air as it continues once again on its hapless journey through space and time. This final scene resonated a reflective statement Forrest Gump made when he pondered lifes big questions at his wife's grave site, “I don’t know if we each have a destiny or if we’re all just floating around accidental-like on a breeze. But I think maybe it’s both. Maybe both are happening at the same time.” I, too, have asked that same question, standing at the gravesite of my beloved wife of 37 years. Is there a definitive plan or are we all just like feathers drifting in the wind? In this stop-motion animation film about the real meaning of life, a 6-year-old girl narrates and asks, "How sad would it be to get to the end of your life and realize you never truly lived?" After citing the main regrets of elderly people to be the things they didn't do rather than the things they did, she encourages us to genuinely consider the path we would like our lives to take. As you listen to her explain the meaning of life, it's easy to reminisce on your own childhood, the days when you were guided strongly and honestly by your own heart to follow your dreams -- no matter how big. Watch the true life story of Richie Parker, a man who overcame being born without arms to become a chassis and body component designer for Hendrick Motorsports.This is an Incredibly inspirational story. It makes you realize how blessed you really are and that you have nothing to complain about! Evangelist Reinhard Bonnke is principally known for his Great Gospel Crusades throughout the Continent of Africa. The son of a pastor, Reinhard gave his life to the Lord at age nine, and heard the call to the African mission field before he was even a teenager. After attending Bible College in Wales, and his ordination in Germany he pastored a church and then went on to start missionary work in Africa. It was there, in the small mountain kingdom of Lesotho, that God placed upon his heart the vision of 'the continent of Africa, being washed in the precious Blood of Jesus' — an entire continent, from Cape Town to Cairo and from Dakar to Djibouti that needed to be reached and to hear the proclamation of the signs-following Gospel. The Inspiring Story of Olympic Champion Dominique Moceanu’s Secret Sister - Jen Bricker was born without legs, but that didn't stop her from playing several sports and pursuing her love of gymnastics — a passion that led her all the way to the Junior Olympics, where she competed as a power tumbler. Today, as an adult, Bricker enjoys a successful career as a professional acrobat and aerialist; she’s toured the world with Brittany Spears and worked at Disney World. Willard Wigan tells the story of how a difficult and lonely childhood drove him to discover his unique ability -- to create art so tiny that it can't be seen with the naked eye. His slideshow of figures, as seen through a microscope, can only be described as mind-boggling. Willard Wigan sculpts figures small enough to fit on the head of a pin. To create these microscopic masterpieces, he works diligently through the stillest hours of the night, between his own heartbeats. Nicholas James "NICK" VUJICIC was born with tetra-amelia syndrome, a rare disorder characterized by the absence of all four limbs. As a child his lack of limbs made him a target for school bullies, and he fell into a severe depression. At age eight, he contemplated suicide and even tried to drown himself in his bathtub at age ten; his love for his parents prevented him from following through. Nick prayed very hard that God would give him arms and legs, and initially told God that, if his prayer remained unanswered, Nick would not praise him indefinitely. However, a key turning point in his faith came when his mother showed him a newspaper article about a man dealing with a severe disability. Vujicic realized he wasn't unique in his struggles and began to embrace his lack of limbs. After this, Nick realized his accomplishments could inspire others and became grateful for his life. Nick gradually figured out how to live a full life without limbs, adapting many of the daily skills limbed people accomplish without thinking. Nick writes with two toes on his left foot and a special grip that slides onto his big toe. He knows how to use a computer and can type up to 45 words per minute using the "heel and toe" method. He has also learned to throw tennis balls, play drum pedals, get a glass of water, comb his hair, brush his teeth, answer the phone and shave, in addition to participating in golf, swimming, and even sky-diving. Watch this awe inspiring video of a limbless man who lives life to the fullest! Watch the awe inspiring story of GABBY DOUGLAS, the 2012 all-around Olympic gymnastics champion. Listen as Gabby explains how she was able to achieve Olympic gold at such a young age. Above all, show this video to all members of your family, especially your children and grandchildren. Let them watch a young person who lives her life to the fullest! BEN CARSON is one of the most famous and respected doctors in the world. Since the 1980s, his surgeries to separate conjoined twins have made international headlines, and his pioneering techniques have revolutionized the field of neurosurgery. Almost as important is that Carson has become a role model for people of all ages, especially children. Although he works thirteen-hour days and performs hundreds of operations a year, Carson makes time to spread his message that anything in life is possible, regardless of what color a person is or where he is from. Carson speaks from experience. He went from the inner-city streets of Detroit, Michigan, to the halls of Yale University, to director of pediatric neurosurgery at one of the most prestigious hospitals in the United States. The real hero of Dr. Ben Carson's story is his mother,Sonya Carson . Through her strong faith in God, she raised her two sons out of poverty, Curtis to become an electrical engineer and Benjamin to become a pediatric neurosurgeon. Watch this true story about how a mother's faith-filled words lifted her two boys to live their lives to the fullest. Actor WILL SMITH gives some inspiring insights into creating success and fulfillment in life and becoming everything you ever dreamed of. Will also shares his personal beliefs for creating an extraordinary life and living life to the fullest. TODD WHITE was a drug addict and atheist for 22 years when in 2004 He was radically set free! Redemption and righteousness are the foundation and the keys to the new creation reality that we are to live in and from. God has simply opened Todd's eyes to this truth and that Holy Spirit wants to flow through every believer everywhere we go, at work, school, grocery stores, malls, gas stations, everywhere. His true joy is being able to reproduce in people the simplicity of this reality, in a 24/7 kingdom lifestyle! This is for every believer! No one is excluded! In 2007, DANNY MACASKILL was just an ordinary guy working a nine-to-five job as a mechanic in an Edinburgh, Scotland bike shop. In March 2009, he took a risk and left his job to pursue his life's passion of entering an obscure sport called street trials, where bicyclists use existing structures to create physical puzzles that are solved by moving from obstacle to obstacle. A month later his roommate, Dave Sowerby, released a video of MacAskill leaping, flipping, and balancing across Edinburgh’s famous buildings, parks, and back alleys on his bike. No one had seen riding like this before. Some even chalked MacAskill’s mind-bending moves up to a special effects hoax. The video went on to be viewed 27 million times. Watch now in awe as MacAskill's body shifts, twists, and then explodes upward in a seamless tangle of man and bike - when man and bike become one! Danny MacAskill inspires each of us to live life to the fullest! When JARRETT J. KROSOCZKA was a kid, he didn’t play sports, but he loved to draw and write stories. With the help of a supporting cast of loving grandparents and teachers, this son of a heroin addict grew up to become the successful creator and author of such beloved children’s book characters as Monkey Boy and the Lunch Lady children's series. BOBBY BOWERS was one of the East Coast's top drug kingpins. Sentenced to 60 years in prison for attempted murder and drug distribution, that should have been the end of the Bobby Bowers story, but it wasn't. It was just the beginning. Watch this powerful video showing how God's grace can take any hopeless situation and completely turn it around to bring Him glory. Always remember the words of Jesus recorded in Matthew 19:26 - "with God, all things are possible!" Bobby's favorite Bible verse is found in Jeremiah 29:11 - "For I know the plans I have for you," says the LORD. "They are plans for good and not evil, to give you a future and a hope." Please share this inspiring true story of lasting hope and redemption with everyone! Nicky Cruz, former New York gang leader. Growing up in a home where his own mother called him "Son of Satan," Nicky drifted into a lifestyle of crime and violence. Hear Nicky's own story of how the love of Jesus demonstrated through a preacher he threatened to slice into pieces changed everything! Thank God for powerful testimonies like Lecrea's. A testimony is not to glorify ourselves, but to let others know that God loves us all. Christianity is not about pointing fingers about one's past. It is about moving forward in life with the grace and mercy of God. Jesus did it all on Calvary. The greatest thing we can ever do is share our testimony of His Love and Mercy with everyone who is destined by God to cross our paths. With sadness in his eyes, the greatest evangelist of the 20th century has watched the country that he loves slide rapidly into moral chaos and Godless self-indulgence. Please share this powerful video with everyone you know! The Story Behind the Hymn, What a Friend We Have in Jesus. Watch the true story of Irish born Joseph M. Scriven (1819-1896), 25 years old, in love and to be married. The day before his wedding his fiance died in a tragic drowning accident. Heartbroken, Joseph sailed from his homeland to start a new life in Canada. While in Canada working as a teacher, he fell in love again and became engaged to Eliza Roche, a relative of one of his students. Once again, Joseph's hopes and dreams were shattered when Eliza became ill and died before the wedding could take place. Although one can only imagine the turmoil within this young man, history tells us that his faith in God sustained him. Soon after Eliza's death Joseph joined the Plymouth Brethren and began preaching for a Baptist church. He never married, but spent the remainder of his life giving all his time, money and even the clothes off his own back to help the less fortunate and to spread the love and compassion of Jesus wherever he went. Around the same time that Eliza died, Joseph received word from Ireland that his mother was ill. He could not go to be with her, so he wrote a letter of comfort and enclosed one of his poems entitled 'What a Friend We Have in Jesus'.